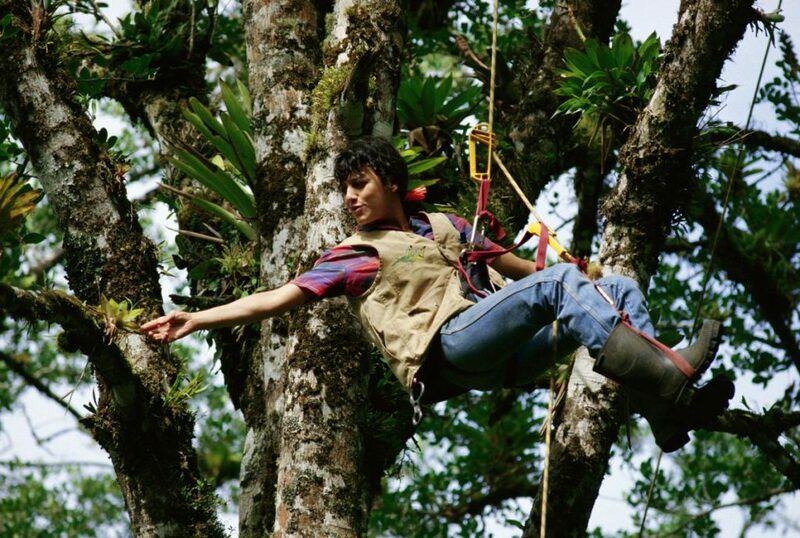 I have a great job; I climb trees to study the rainforest canopy. My journey to understand trees started early in my life, when I climbed the eight sturdy sugar maples in the front yard of my home in suburban Maryland. Most afternoons, I would drop my school books inside the front door, grab a snack and a book, and scramble up one of those trees, each with its own vertical pathway to a comfortable nest aloft. Those perches were refuges from the world of homework, parental directives, and the ground-bound humdrum of the everyday. I could look out across my home territory, check on the progress of squirrel nest constructions, and feel the strong limbs of those trees holding me up for as long as I wished. It was in those afternoons of arboreal repose that my sense of kinship to trees germinated. Trees were not my only focus in those formative years. My parents provided me with modern dance lessons from Erika Thimey, a German-born dance teacher who offered the gift of creativity to her students. 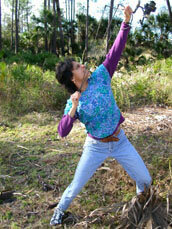 I learned the expressive ways the body can move and acquire the discipline that is needed to hone my muscles. From Miss Erika, as we called her, I learned that with mindfulness, the simple act of walking across a wooden floor or noting the graceful fall of a leaf can be an aesthetic action. It opened up a whole different way of seeing that has kept me aware of the multiple ways that one must look at nature to understand it fully, an approach I now bring to my scientific work. In college, I first discovered the world of forest ecology through the lectures of an ecologist, Dr. Jon Waage. When he wasn’t teaching undergraduates, he carried out research on damselfly behavior. I was amazed to learn that he could make a living by sitting at stream edges to record the movements of these aquatic insects. From him, I learned about the world of academic science. He posed seemingly narrow questions that later turned out to relate to much broader issues about life and death, competition and mutualism, and the evolution of life on Earth. Wrestling through the labyrinth of the scientific literature, I learned to trace citations to their sources and recognize the key players in a scientific discussion. Science seemed the right approach to really understand the world. But what of dance? With my deepening passion for science, I soon fund myself in something of a love triangle, having to choose between very different professions. Parallel with my enthusiastic forays in science, I delighted in the sparks of creativity that flew from each composition in the dance studio, the sense of feeling my body move with others, the messages about life and emotions conveyable on stage, which no scientific paper could communicate. Right after graduation from college, I decided to test out which would be the better profession for me – field biology, manifested in the scholarly persona of Dr. Waage, or modern dance, exemplified by the graceful spirit of Miss Erika. I first tried on the life of a field biologist. By writing letters to 70 field stations all over the world, and offering my services as a volunteer field assistant, I found a temporary position to help a septuagenarian entomologist (insect biologist). He studied the taxonomy of tropical leaf-feeding beetles and directed a tiny field station in the highlands of Papua New Guinea, in the South Pacific. I accepted with joy. 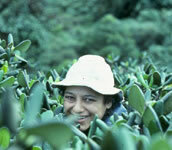 In January of 1978, I arrived at the entrance of the Wau Ecology Institute, in the foothills of the Morobe Province. The field station consisted of a few shabby wooden buildings, a small herbarium and insect collection, and a central table occupied by a chipped coffee pot around which staff gathered each morning to discuss progress on their research projects. I spent the next twelve months on expeditions around the country, thrilled by the stunning diversity of the rainforest. In that rainforest cloister, I felt at home with the people and work I encountered. After the year in Papua New Guinea was over, it was time to investigate dance. I traveled to Paris, and made contact with a modern dance company, Danse Paris. I first took classes, and was then invited to practice with their troupe. The opportunity to dance for hours at a time and hang out with professional dancers was perfect to test out my potential future profession. After a year in the rainforest, it was a delight to gulp in the cultural offerings that only Paris provides. The art museums, city parks, urban architecture, and evening concerts filled my non-dancing times. After six months, I had to make a choice. I knew that I could not do both professional science and professional dance. The former demanded years of academic preparation and wildland settings; the latter required years of physical and aesthetic training and an urban homespot. On a sunny morning in April, I sat down with my journals from both locales at a neighborhood café. Over numerous cups of tea, I read through them all and then sat back to decide which was to be my choice. The forest or the stage? As much as I loved the world of dance, the time I spent in the tropical rainforests seemed truer to my own spirit. I felt closer to my biologist colleagues, and more at peace in the forest environment. I returned to the USA and entered graduate school in forest ecology at the University of Washington’s College of Forest Resources. I spent a summer in Costa Rica on a field biology program, surrounded by fledgling graduate students and experienced faculty who opened the world of tropical ecology with enthusiasm and expertise. Each had his or her own specialty: hummingbird physiology; beetle distribution; songbird migration. Early on during that course, my eyes looked up to the complex world of the forest canopy – the plants and animals that lived their lives high above the forest floor and were among the most poorly known in the world. I had the good fortune to encounter another graduate student who was studying canopy interactions. Don Perry had developed modified mountain climbing techniques, and he agreed to ‘show me the ropes’ in exchange for help with his field study. After a month, I was ready to climb on my own and to pursue my own set of canopy questions – activities that would enliven my life for the next three decades. My canopy research colleagues, students and I have enumerated the rare and often unknown species that dwell on branches and twigs that never appear in ground surveys. I discovered that some trees put out “canopy roots” from their own branches and trunks, which gain access to the arboreal soil that accumulates beneath mats of canopy-dwelling (“epiphytes”). We learned that treetop versions of traditionally terrestrial insects and even earthworms – are found in this canopy-level soil, living out their entire life cycle high above the forest floor. We have measured the amounts of nutrients that the epiphytes intercept and retain from rain, mist, and dust, which can be considerable. Over the last 30 years, new techniques of canopy access have evolved to include hot-air balloons, treetop walkways, hanging platforms, and 30-story construction cranes. The answers that canopy researchers report in scientific meetings confirm that trees are a critical part of ecosystems, landscapes, and the biosphere. Canopy researchers now quantify the amount of oxygen tree canopies produce, the amount of carbon dioxide they store, the volumes of soil they protect, the amount of water they retain, and the scores of wildlife species they support. Urban foresters have documented the “ecosystem services” provided by trees in urban settings: reduction in noise, temperature, and pollutants. Thus, the growing body of treetop research documents that loss of canopy diversity and function is a loss to the forest as a whole and to the landscapes beyond them. Over the years, aware of the importance of the forest canopy and forest ecosystems in general to the health of the Earth, I have made deep forays into doing outreach and communication of what I have learned. I am especially interested in reaching “non-traditional” audiences, those who don’t automatically pick up a Natural History magazine, or watch a nature documentary film. Each of these projects involves connecting with other partners. One of my programs involves gathering scientist, urban youth, and scientists to spend time in the field and create rap songs about trees and insects. Another program brings science research projects involving endangered plants and animals into prisons so that incarcerated men and women can contribute to solving environmental problems, even though they are behind bars. Another set of my partners to help communicate scientific messages are artists. One of my favorites is a wonderful collaboration with a modern dancer and choreographer. On an afternoon last year, I got a telephone call from Jodi Lomask, the Director of the San Francisco-based modern dance troupe. She wanted to make a modern dance about tropical rainforests, but wanted it to be based in science – could she come to my rainforest study sites with me to learn about them? Indeed she could, and did, and this year, we are performing the dance she choreographed while climbing my rainforest study trees to public audiences in Seattle, San Francisco, and Washington, DC. I feel happy that the two seemingly divergent forces in my life – studying trees and making modern dances – has come together for the sake of protecting rainforests. 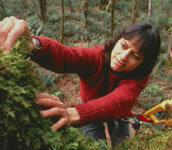 Dr. Nalini Nadkarni is a professor at The Evergreen State College and a leader in the scientific field of rainforest canopy research. 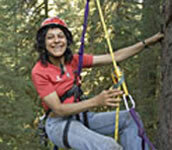 She started a unique method for rappelling to the top of the canopy, using mountaineering equipment and has become known as “The Queen of the Forest Canopy.” She is featured in the Emmy award-winning National Geographic documentary “Heroes of the High Frontier.” She is also the author of three books and numerous scientific research articles. Nalini splits he time between Washington state and Costa Rica.